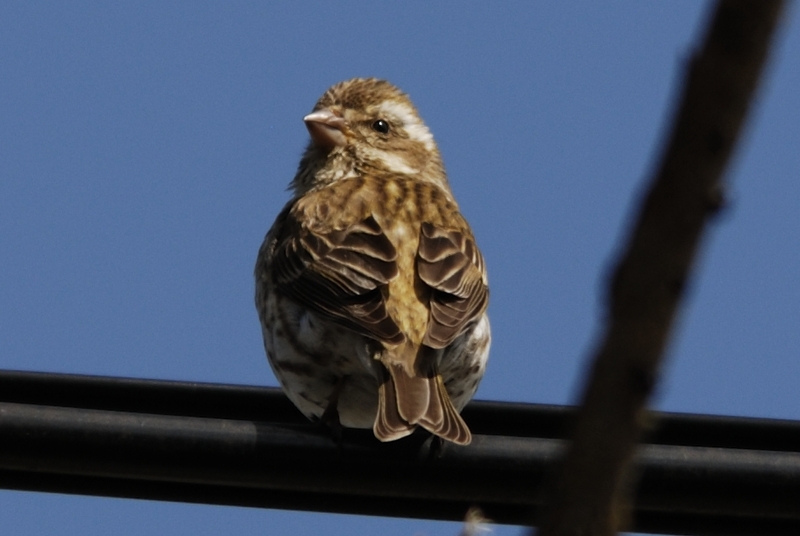 We have two finch species in our region; they are often confused with each other. The Purple Finch (Carpodacus purpureus) is our native species. 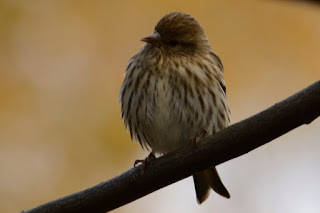 It is not as common as the widespread introduced House Finch (Carpodacus mexicanus) which is native to the western US. The House Finch was introduced in New York in the 1950's and expanded its range throughout the eastern US and southern Canada. The Purple Finch has a heavy, triangular shaped bill. the House Finch has a short, stubby bill. 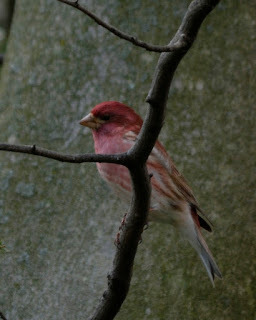 Purple Finches are a much more pleasing bird to look at. The female always reminds me of a miniature female Rose-breasted Grosbeak. Many of those throughout the state have been visited by a Red-breasted Nuthatch (Sitta canadensis) this year. They have been moving southward since early fall. This small nuthatch is a bird of the highest elevations of the east, the Rocky Mountain region, northern US and southern Canada. 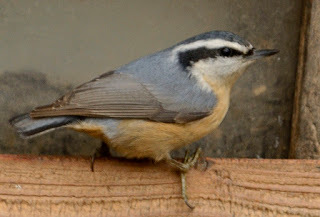 It is much smaller than the common White-breasted Nuthatch (Sitta carolinensis), which is found pretty much nation-wide. 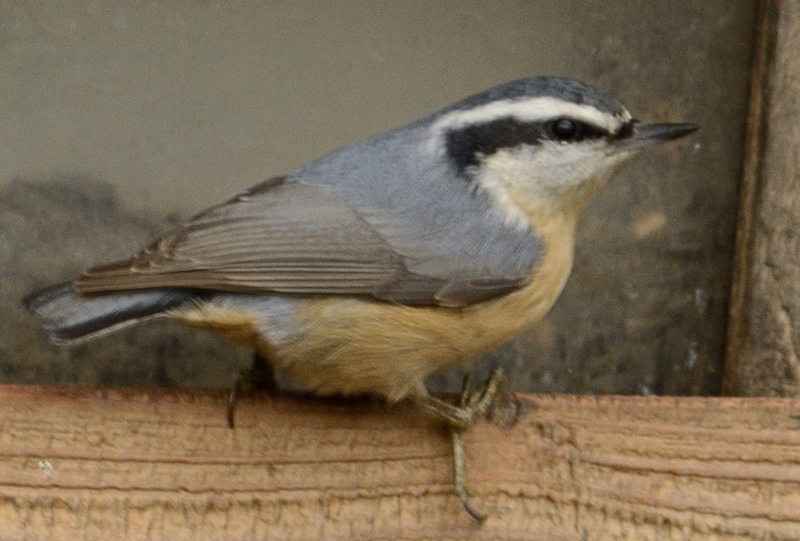 The Red-breasted Nuthatch can be found as far south as the Gulf Coast during the winter season. It can be seen in a location near you. Some of you will not find this hard to believe, some will. Joey likes horses and Waylon, his buddy Ralphie likes cows and Willie. we were riding down the road yesterday and there were 2 horses and a cow feeding on a big round bale of hay. 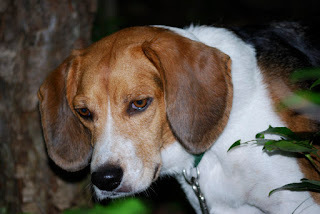 they were about a hundred yards away and I told Joey that there were some horses over there. 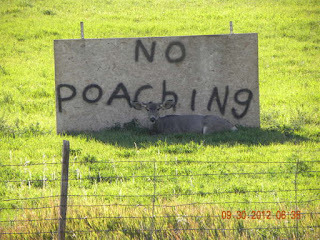 By the time he found them, I had driven far enough that only the cow was visible. He stared at the cow and turned around and glared at me. A stupid people don't know cows from horses; glare. PIPESTEM, W.Va. – The annual January eagle survey of the Pipestem area is scheduled for January 12. 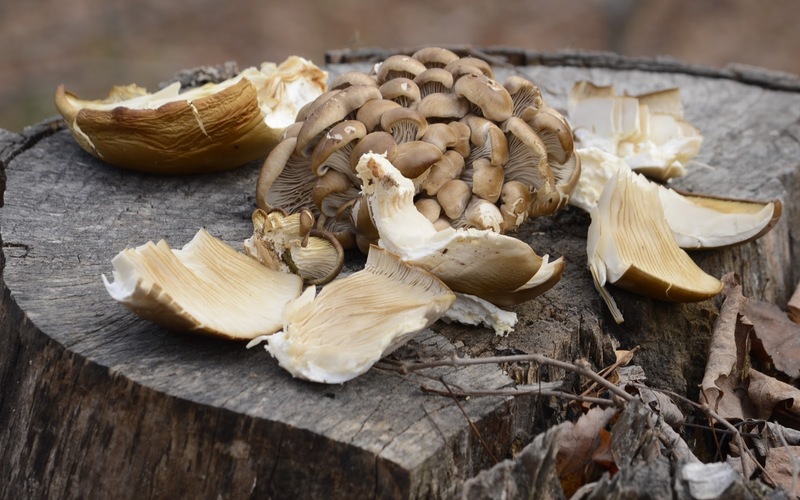 Jim Phillips, Pipestem State Park naturalist, is coordinating the various survey sites and assignments and inviting anyone interested to be part of this winter four-hour foray. Phillips schedules novice birders with more experienced volunteers to scan the skies and record eagle sightings over a four-hour period. Various survey sites include South Overlook of Bluestone Dam, Bull Falls, Bluestone State Park, Mouth of the Bluestone River, Rt. 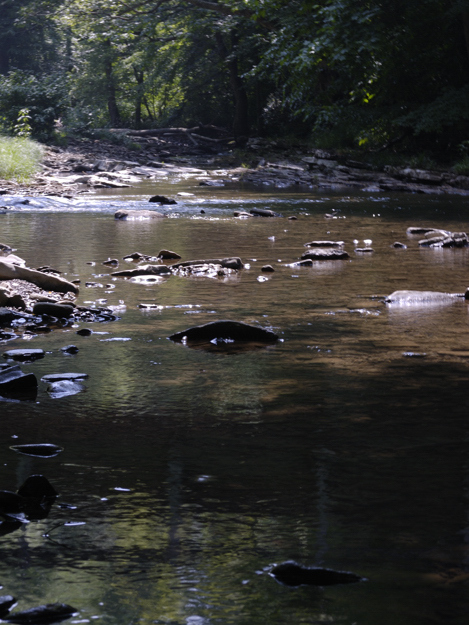 20, Bellepoint Park in Hinton, Bertha campground (Bluestone WMA), Greenbrier River, Sandstone Falls and other areas. “Depending upon how many folks sign up to help, we have from six to 12 survey points established,” said Phillips. In January 2012, 38 people participated and confirmed sightings of 19 bald eagles and an adult golden eagle. In January 2012, with temperatures in the low 20s, 10 individuals reported sighting six bald eagles and two golden eagles. “Our population is growing in southern West Virginia,” Phillips said. To be part of the eagle survey, contact Jim Phillips at 304-466-1800 ext. 344 or email pipestemsp@wv.gov with phone contact information and names wanting to volunteer prior to January 7. Include “Eagle Survey” in the subject line. Phillips contacts participants in advance to determine the best location, to create teams and to forward the forms to record sightings. The survey begins at 10 a.m. and continues until 2 p.m. All participants will meet at the Hinton Dairy Queen at 3 p.m. with collected data. 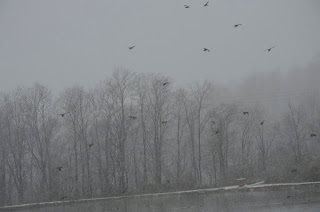 “In recent weeks we have had sightings of adult bald eagles at Bacon Falls on the Greenbrier River and between Forest Hill and Greenville along Indian Creek,” said Phillips. On “The Big Sit” survey in October, Phillips indicates a pair of adult bald eagles was seen at Mt. Valley Lake near Jumping Branch and one adult was there during a November field trip. In spring of 2012, Phillips witnessed two bald eagle fledglings. Phillips schedules eagle watches as part of his interpretative programs at Pipestem State Park. Activities organized by Pipestem Resort are regularly posted at www.pipestemresort.com/Activities.pdf. I was sitting in traffic today, headed west out of Harman on Rt 33. Soon after we got moving again, I saw a dust cloud arrise from the road ahead. An unexpected tree had fallen into the road; luckily it was between traffic strings and didn't hit anything. I knew we were in for another delay and I was getting caught up on paperwork, as I was sitting there. I noticed Ralphie staring to my left, I assumed he was just trying to learn to read. Soon after, Joey started staring that way, too. I looked up and there were 2 guys in one of the tree service trucks from Macon, GA. They were staring down and grinning. The driver said something and I rolled down the window. 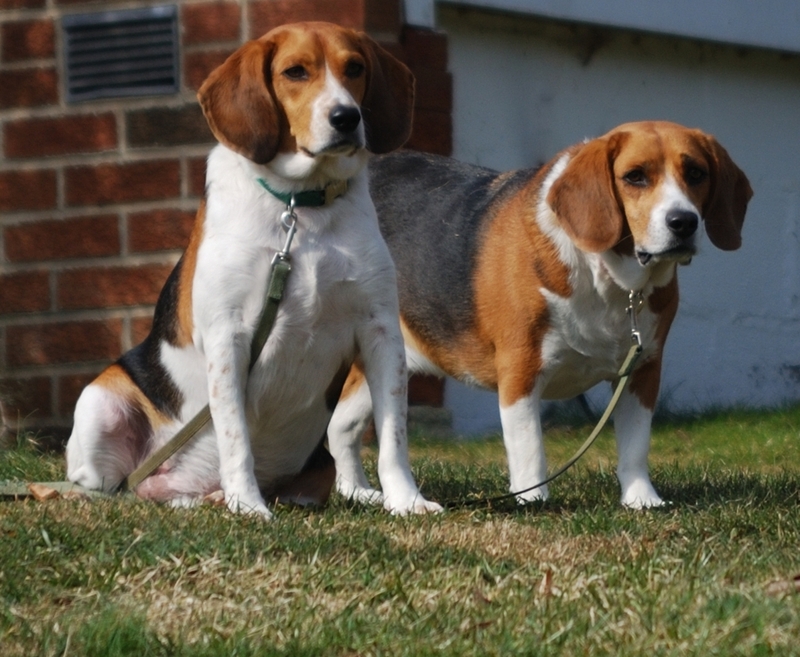 He said that those 2 beagles look like Little Mafia Hit Men; waiting for something to happen. I guess I have the only gaurd beagles in the country. Just look at these little angels. Many times, most times we come up with ideas which never turn into reality. On occasions; they do. Some spin their wheels in the same old rut from year to year to year; others don't. One of the most enjoyable periods of my life was during the years of 2007 and 2008 and one place that made it so was Stillwell Park, near Marlinton, WV. My work day started in Marlinton at 1:00 pm and my mornings were free. I could be found in the mornings five days per week either on Knapps Creek, Marlin Mountain or at Stillwell Park. Life was good, but things change, companies change hands and life goes on. I have not been in Marlinton since early in 2009. But during my time there, I discovered a birdwatchers paradise. I have never seen such diversity of habitats and species as can be found in such a small area as Stillwell Park. I never saw one other person enjoying the bounty; either. 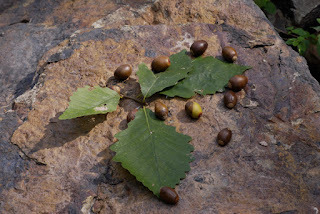 Two or three years ago, I mentioned this to a couple of the active members of the Pocahontas Nature Club. 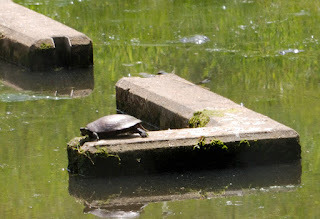 They took off on the project from there and the Stillwell Nature Trail has become reality. The grand opening will be on Saturday, September 29, 2012 at 8am. Sadly, I know that I will not be able to attend. But the resource is there for all to enjoy. You can read the article in the Pocahontas Times and be there to participate in the opening of the trail; if you can make it. I would encourage all birders and nature lovers to make this lovely little park a destination anytime you are in Pocahontas County. 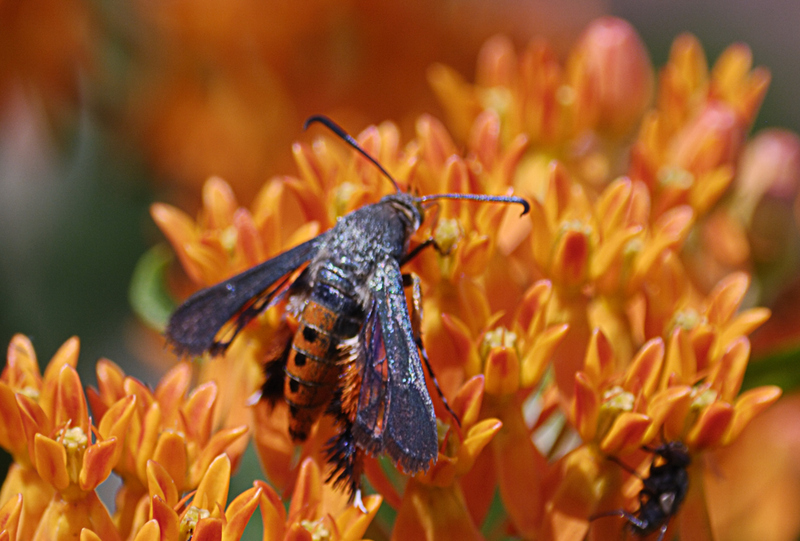 It is worth the trip and wildlife abounds; year-round. I regret that I could not participate, hands on in this project. But, I am glad it has become a reality. The area is home to a numerous and diverse bird population. The records that I kept and submitted for the project do not touch the numbers of species that use the area throughout the year. All of my observation were made between about 11am and 12:30 pm. These are not exactly prime-time birding hours. Flycatchers, warblers, woodpeckers,vireos and sparrows abound. Raptors soar above and migrating waterfowl and shorebirds stop to rest. What more could you ask for? Some of my most memorable sightings include the day I was sitting in my truck at the sewage pond, reading the USA Today and a Virginia Rail popped up out of the ditch and stared at me. Least Bitterns used the area on a couple of occasions, I found them just above the discharge into the Greenbrier. I found White-rumped Sandpipers in the flooded field at the pavillion one May morning. One day in the fall the un-cut grasses were covered with Grasshopper Sparrows. 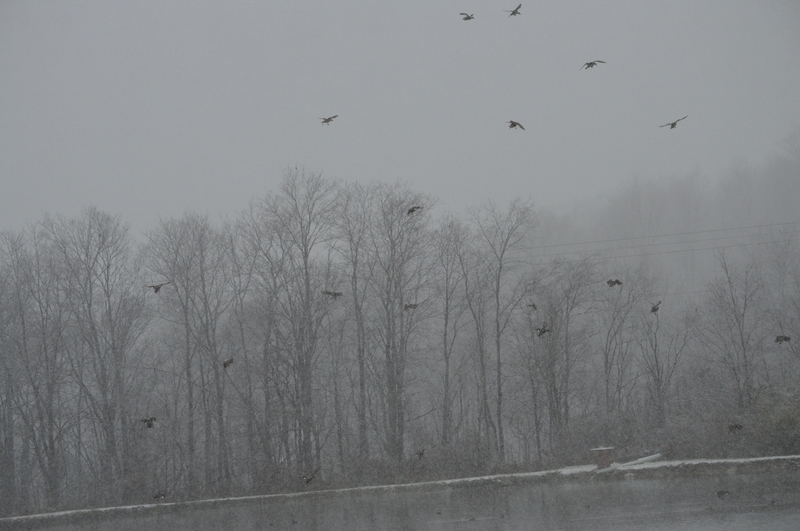 On a Winter day, I saw the largest number of Tree Sparrows that I have ever seen. You just never know what you may find if you are just observant. You will be rewarded for your time, no matter what. For some odd reason; I never did see an eagle there. So right there is something to look for and record. Just get out there and do it. Thank you Pocahontas Nature Club ! One thing I really regret about my time in the area is that I was between cameras during this time period. I finally purchased a real camera in January of 2009. This fox squirrel photo is the only one I have from Stillwell Park. It is one of the very first digital photos that I ever took. Migration time is at its peak, right now. Each morning brings new birds for us to enjoy. The sulking thrushes are often overlooked among the colorful warblers bouncing from branch tips. But, they are here in numbers, too. The song of the Wood Thrush is known to all, Hermit Thrushes are the only thrush that we may find overwintering here. The Veery is very common and unknown to many. Most have not even heard of the other two. The Swainson's Thrush (Catharus ustulatus) does nest here in the highest elevations of Pocahontas, Randolph, Tucker, Pendleton and Grant counties. 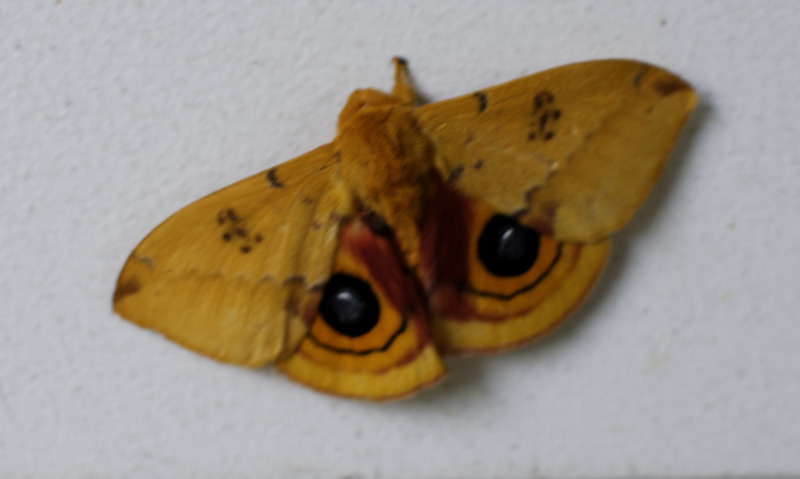 The buffy eye-ring is themajor identification point for this species. The majority of the population nests in the North, in the middle regions of Canada and Alaska. The entire population is on its annual southward move, right now. The Gray-cheeked Thrush (Catharus minimus) is the nesting thrush of the Far North. It nests throughout Alaska and Northern Canada. It is a bird of the northern spruce forests. It is distinguished by its partial eye-ring and a duller grayish appearance. It may be found in any overgrown area near you, right now. Like I have said many times before; you never know what you may find, if you just look. Be observant and you will be rewarded. 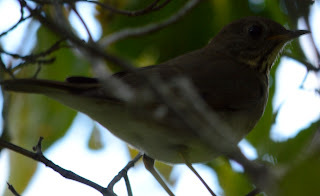 The photo of the Swainson's Thrush was taken at Camp Garnett on the Rich Mountain Battlefield in Randolph County, WV. The Gray-cheeked Thrush was photographed in my yard in Norton, Randolph County, WV; yesterday. I went out early this morning, hoping to find some interesting migrants in the clear-cut. The birds didn't seem to cooperate; as far as the warblers go. There were plenty of robins, cedar waxwings, catbirds and goldfinches; but little else was to be found. Therefore Ralphie and I went to plan B. 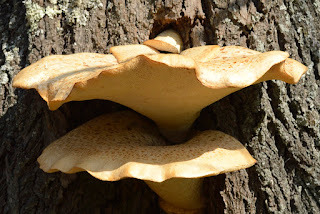 Search for some Chicken of the Woods. Well, that didn't go so well, either. 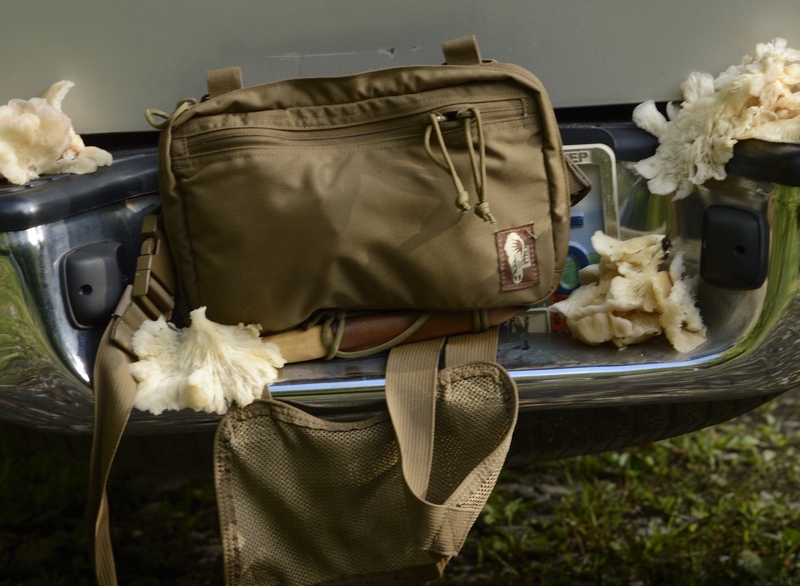 But we did come up with enough Oyster mushrooms for a meal. 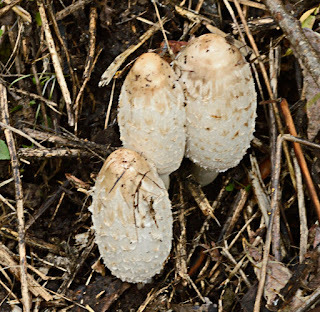 We found several other clumps which were too old and badly insect infested. 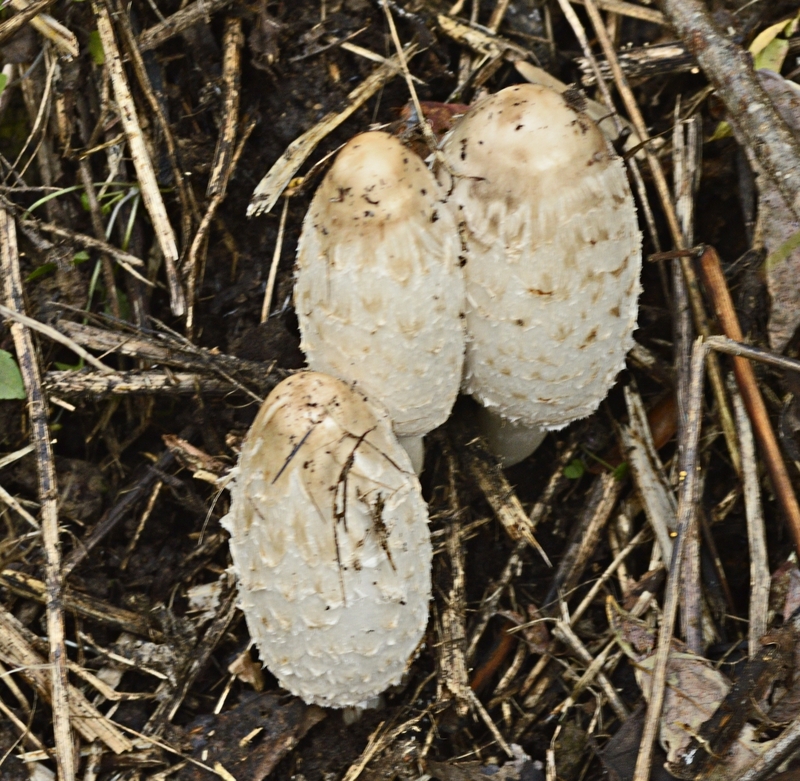 I was walking the dogs on Wednesday, near the Shavers Fork River in Randolph County and noticed this white fungi on a rotted log. 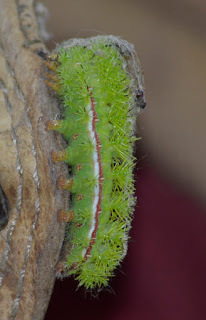 I had seen this species before, but didn't pay much attention to it. 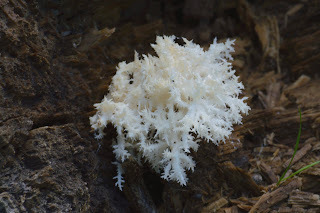 I thought it was one of the coral fungi. 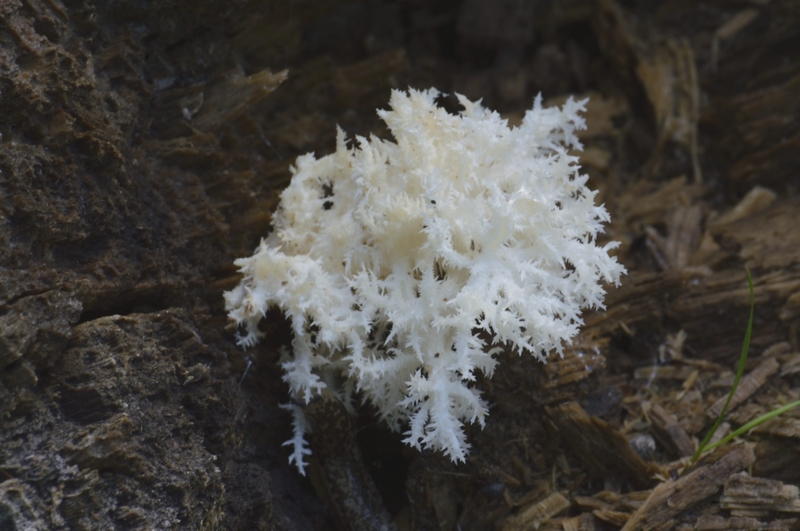 Comb Tooth (Hericium ramosum) is supposed to be a good edible. 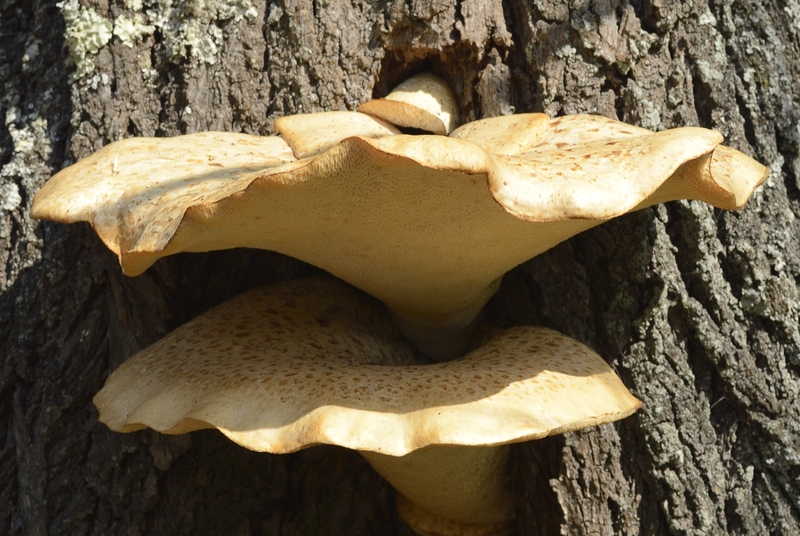 It grows on dead wood. Being a very pretty fungi, I didn't even think of it as an edible, until I looked it up. I plan on trying this one if I find some again. 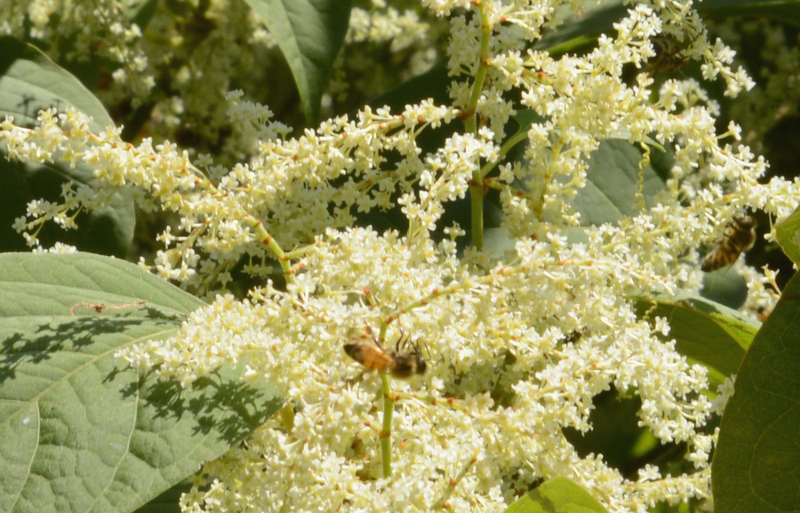 I was standing out in my yard last week and was in awe at the number of honey bees on the Japanese Knot-weed (Polygonum cuspidatum) in my yard. There is a solid wall of Knot-weed which is about 25 yards long bordering my front yard. This non-native invasive species sure does make a nice, summertime privacy fence. It was in full bloom and absolutely covered with life. The majority of the insect activity was comprised of several thousand honey bees, busily working on the buckwheat like flowers. 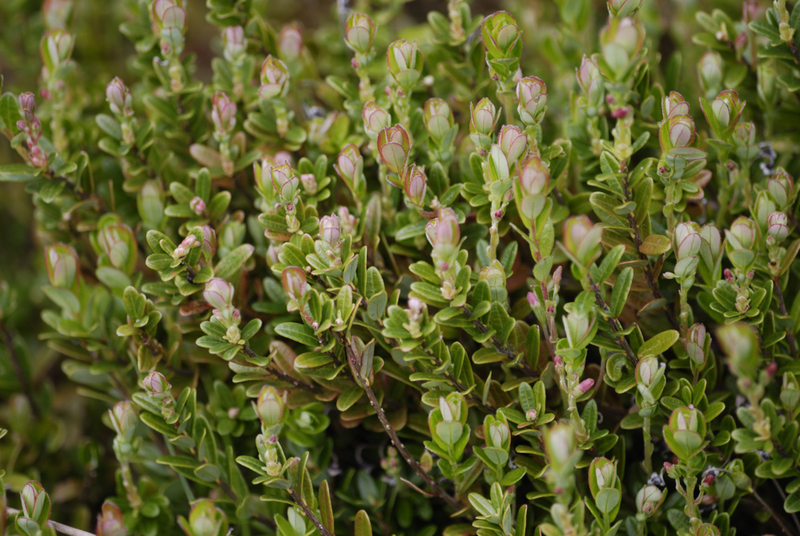 I am sure that many pounds of honey will be produced from these tiny white flowers. As I marveled at the sight and intense activity; I couldn't help but chuckle and think to myself about our silly governments' thinking and reasoning. You see, earlier this summer some federal employees were handing out information about the terrors of knot-weed at one of our local fine eating establishments. You could buy some gray, compressed chicken paste fried in grease and learn all about this nasty invasive. Sometimes you just shake your head and move on. I started thinking at the time this program was announced; which is worse? I could come up with several good things about this invasive weed and none about the rest of the parties involved therefore; which one is the most noxious? Japanese Knot-weed blocks out noise and sights from the highway, feeds numerous insects, can be turned into honey, makes great compost and I have heard that it is edible when young and prepared like asparagus. On the other hand, I couldn't come up with any redeeming qualities for compressed chicken slime or wasteful spending by the federal government. Now you tell me which is the greatest threat to us all. Both of the latter are very hard to swallow. 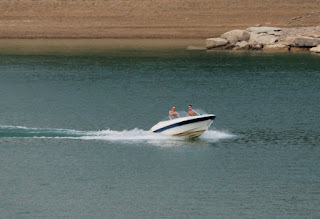 The Virginia General Assembly established boating safety requirements in 2007. These requirements are being phased in and all boaters and personal watercraft users will be required to complete a Virginia boaters safety course by 2016. 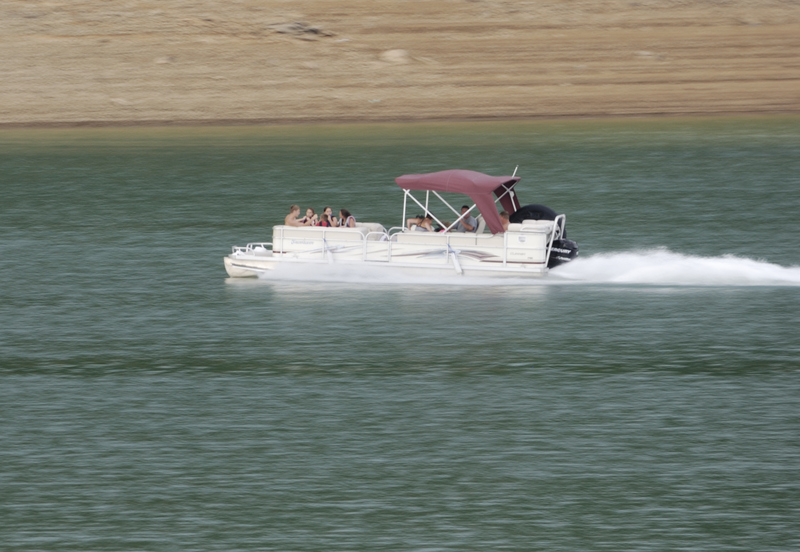 All boaters will have to pass a NASBLA approved safety course either in a classroom or online. The only exceptions are for Registered Commercial Fishermen, those who have held or currently hold a license to operate a vessel (Master, Captain or Mate) issued by the US Coast Guard or those who currently hold and posses a NASBLA approved card or certificate. These cards do not expire. It is a once in your lifetime thing that you need to do. 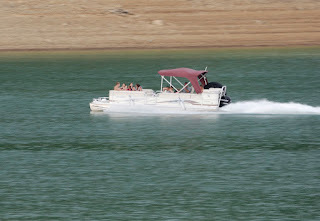 On July, 1 2012 ALL PWC (Personal Watercraft Users) regardless of age must posses a boating safety course card. No person under the age of 14 may operate a PWC. All Boat operators ages 30 and younger must have completed a course. In 2013 all boaters 40 and younger must have completed the exam. 2014 includes those 45 and younger and in 2015; everyone operating a boat who is 50 or younger must have passed the exam. Finally, in 2016 ALL boaters must have completed a NASBLA approved boating course. I stopped at my favorite summertime spot on Backbone Mountain, today. The milkweeds are in full bloom and vanilla fills the air. It was even hot up there today. Just a touch of breeze and Monarchs ! I was able to see five individuals at the same time. 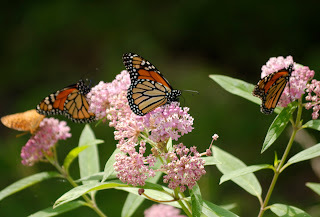 I believe that may be more than I saw up there all of last year; which was not a good Monarch year. One pair was in the process of mating and I am sure that there will be many eggs laid soon. I don't think I even found one caterpillar last year, up there. I do remember one crystalis which didn't hatch. Hopefully, 2012 will be a good year for the Monarch. They need a good year and deserve a break. 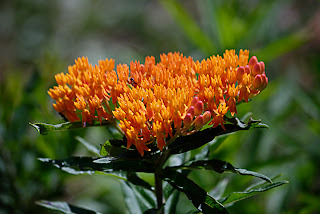 I sure do love the smell of a big patch of milkweed in the hot Summer breeze. It just makes a miserably hot day just a little easier to tolerate. I pulled my garlic on Tuesday; yes pulled. Never in my life have I ever been able to pull up my garlic; without damage. The ground is just dry powder. A few years ago, we had some rain and then it got hot and dry at harvest time. I had to beat a crowbar into the ground and pry up each bulb. This year, I didn't even have to pull very hard for it to come up. It is probably the nicest crop that I've had here; though. Glad to have it! 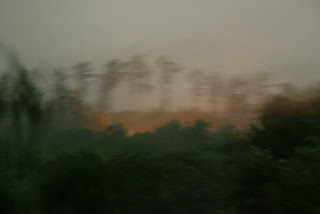 The skies darkened on June 29, 2012; the wind came. Lots of wind, red oaks and hickories bent almost in half. Some lost the fight. The hill turned an eerie green, a few pops and then bright orange. The fire spread quickly from north to south, popping and crackling. The rain came and extinguished the flames. Seventy-two and a half hours later, electric was restored in Norton. A storm to remember; to be sure. They Got That One Right ! I was sitting out in the edge of my yard on Tuesday and a little yellow butterfly fluttered by. 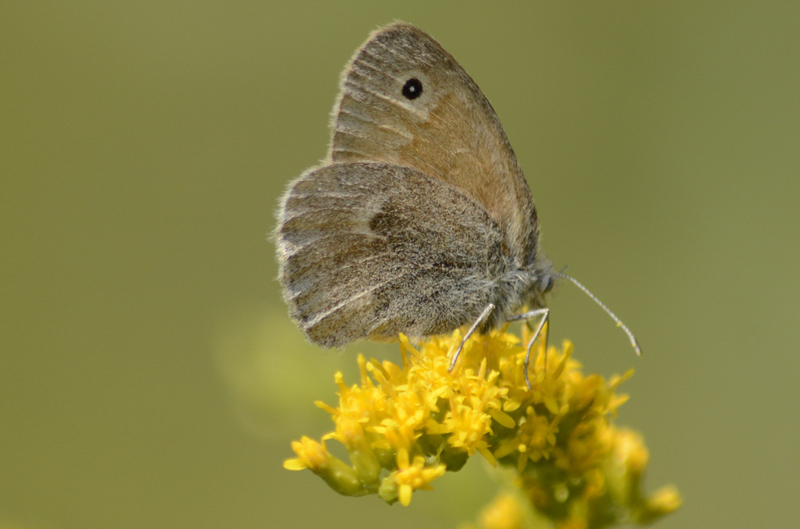 I had never seen a yellow butterfly that was smaller than the normal sulphur species'. I managed to chase it down and get a good look as it stopped on some white clover. I went into the house to get my camera; of course the camera was outside in the truck on the other side of the house. Just as standard procedure plays out the little butterfly was nowhere to be found when I returned. Often, when you look something unfamiliar up; you wonder how they came up with a name for something. Not in this case; they finally got one right. It was a Little Yellow (Eurema lisa) butterfly. 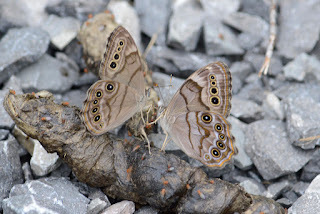 It is more common in WV in the southern counties and along the Ohio River. I am pretty sure that I have never seen one around here. 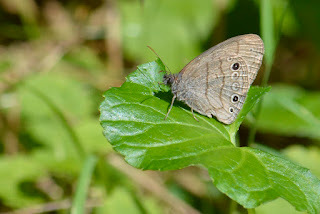 We may notice more smaller butterflies this year, since there doesn't seem to be many big ones around. I am puzzled as to why this Giant Leopard Moth (Hypercompe scribonia) would choose to lay her eggs on an alunimum porch ceiling; instead of a host plant? I found her laying eggs this evening. 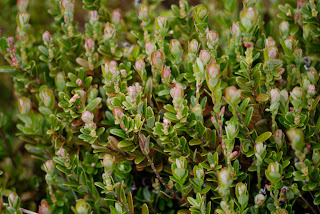 Host plants for this species are sunflower,cherry,maple and willow. There are numerous cherry and maple trees within site of this location. There are cherry trees within 15 yards. Nature tends to make the observant one wonder.. I got up early this morning and drove to Cassity to do an abundance count for the WV Breeding Bird Atlas in the Cassity-6 block. The time spent there was fairly uneventful; nothing unexpected and no rarities. I did record a nice variety at a couple of points. I'm sure that I found a few new species for the block. I haven't had time to look at the previous entries, yet. On the way back home, I decided to check out Camp Garnett on the Rich Mountain Battlefield property. I have heard a Golden-winged Warbler, or a hybrid of such there twice in the last couple of weeks. I messed around there for about a half hour and gave up. There was just too much traffic. Nothing had a chance to settle down, before another vehicle came through. 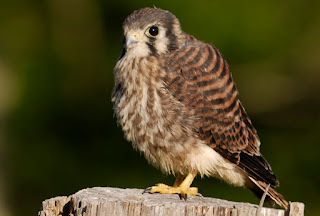 I headed back toward Mabie; the family of American Kestrels were where I found them last week. I headed on down the road and much to my surprise there was a male Bobolink sitting on the power line. You just don't know how much time I've spent in Canaan Valley; trying to get a good Bobolink photo. Here one is, totally unexpected and 6 miles from home. I dug my camera out, set some adjustments and turned around. It was still there, but there was nowhere to pull-off. I drove on up the road and was planning on getting a photo out of the window, when I came back down. Of course, it was then gone. It was all ready running through my head to come back tomorrow morning and try again. I still had the window down as I drove down the hill and a baby bird noise caught my attention. 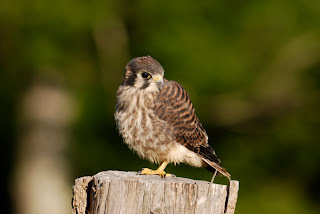 I looked over and a young Kestrel was sitting on top of a fence post. I quickly pulled off the road and got out; hoping for one decent photo. I kept walking and pressing the shutter and as luck will sometimes happen, it let me get very close! There was another young one about 100 yards away in a maple tree and both adults were present. 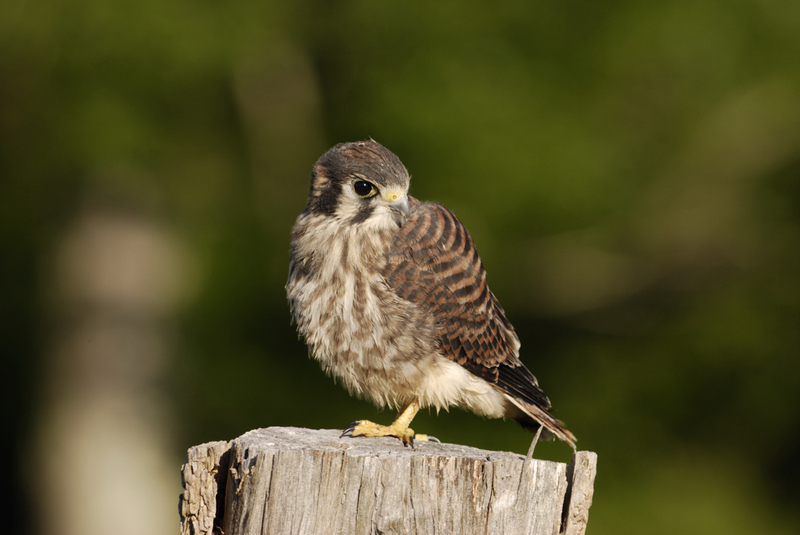 There are two successful Kestrel nests in the same area, within a quarter mile of each other, Nice! But still no Bobolink photo. I decided to celebrate the end of the WVDNR's annual food dispersal program this morning and go fishing for a little while. I knew that there would not be anyone else out there; since they have finally quit stocking. Flags were flying straight out when I got to Elkins. I almost turned around, but decided to just go to Bowden, instead of heading up on Cheat Mountain. I knew that with the wind and the cold front the fishing would be slow and the trout would be hugging the bottom. I arrived on the Shavers Fork and tied on a pair of Clouser Minnows. These are my favorite flies; when the fishing is though. It has been a long time since I have had a chance to actually fly fish. Probably 4 years other than stop and cast a few times. 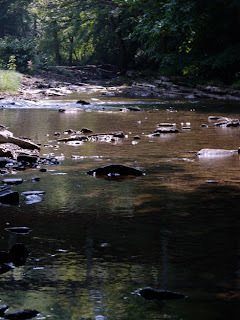 I entered the river and the water was nicely cool for June. The wind was howling upstream. I crossed the river to a split on the other side, which was protected from the wind; slightly. Casting was difficult with my 5 weight rod and a pair of weighted flies. On my third cast; there it was, that clouser thump. It has been a long time since I have felt that. Nice fish, too. I fished the section thoroughly and had only one other strike. The wind picked up and I was hitting myself with the flies, as often as they were hitting the water. But; it was really nice to fish for a hour and a half and not be bothered by others. I'm glad that the fish trucks are finished. Now; maybe the rest of us can catch a few fish ! Everyone is familiar with the brightly colored Baltimore Oriole but its smaller relative often goes unnoticed. The Orchard Oriole (Icterus spurtius) is not as colorful. 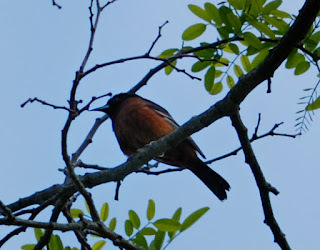 The breast color of the Orchard Oriole more resembles the coloring of a Robin. These orioles also tend to nest in close proximity, unlike the Baltimore who doesn't like anyone in their territory. We seem to have an abundance of Orchard Oriole in our region this year be on the lookout for them and meet your new neighbor. They will not be around for long; maybe another month or so and they will be headed South once again.